I've been lazy. But the large amount of snow we got overnight is supposed to last a few days and more is coming on Tuesday. So today I decided to mount the BBS wheels with winter tires on the STI. 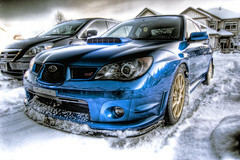 Nice pic...yeah, the AWD on the STi really shines when it snows.